Bluhm Enterprises adds a line of LED Light Bar mounts and LED Post Mounts to increase mounting options for various applications where the standard mount isn't quite working out. These mounts provide accessory mounting options to aid in installation on different surfaces. These are available in the 1.75" and 2.0" bull bar/ roll bar size, sold in pairs. 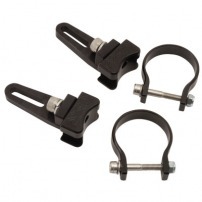 These universal mounts help any post mounted light be mounted to a handle bar or bull bar/roll bar with ease. The small champ is a 1.25" clamp that requces down to a 7/8" handlebar, the larger is a fully adjustable clamp from 1-5/8" up to 2.75" . Sold in pairs.